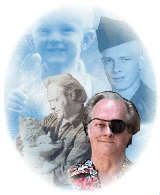 Lance Thurston's Intuitive Guided NLP Reframe On..
Everybody is intuitive... every man woman and child, puppy dog and kitten on the planet is intuitive. The trouble is, what are they reading from you about your opinion of yourself? And this is the problem you see because if YOU aren't happy with yourself, if YOU don't love yourself, why would anybody else be dumb enough? To attract love... you must first FEEL lovable! The key is to work on yourself, not on somebody else. The more whole, happy, joyful and lovable you feel the better quality of relationships you'll attract and have. If you work on your self and your own feeling of lovability... you can become so emotionally attractive that you can become addictive. You must KNOW and I mean "K N O W" with every little bone in your little body, that....you are lovable! When are you going to be able to look at yourself in the mirror and want to hug that cute kid? And when are you going to have that feeling that anybody who doesn't love you is... weird? "Hey I'm great! Are you good enough for me?" If you truly EXPECT to be loved, then everybody WILL love you. It's like you're psychically asking for it, but not out of need but out of shear "Hey I AM LOVABLE therefore LOVE ME!" e m o t i o n s aren't logical..
Changing your emotional beliefs is where this guided audio can help you! 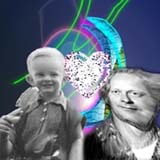 Lance will show you how to examine out-dated beliefs (first learned as a child) and update them! NLP is a powerful technique that can help you get the results you want quickly and easily! 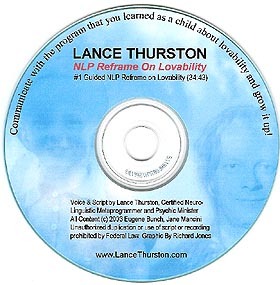 Order Lance Thurston's Intuitive Guided NLP Reframe On LOVABILITY and discover what others will soon discover.. a more joyful, lovable YOU! CDs are OUT OF STOCK! However MP3 downloads of Lovability are available! Download Terms: Lovability, Anger, Healing Meditation audio sessions are copyrighted and are for personal use only. They are not for resale. Disclaimer: These audios are not meant to diagnose, treat medical problems or to be used as a substitute for medical treatment, counseling or mental health services. PLEASE NOTE: We recommend downloading and listening to Lance's intro about himself and his work / sessions for FREE prior to experiencing any of Lance's guided NLP Sessions. Hear Lance FREE on Myspace! I m a g i n e. . .
what you would be like if you had been raised with unconditional LOVE, no conditions whatsoever, you were purely loved, no conditions... complete acceptance, you did not have to shift or change to become a good little boy or a good little girl... and you had been raised with a total sense of safety and security? What would your life be like if you had been raised like that? You'd have a sense of confidence, a sense of self-esteem, lovability and knowingness that would lead you into a naturally joyful life! Lance's N.L.P. Intuitive Guided Audio Sessions are truly different. Rather than just informing you, they actually show you how to change yourself quickly and simply in a new way. and more! Hear Lance FREE! Angels, Fairies, Cupids, Cherubs, Guardians & More!